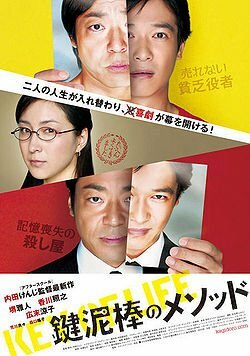 My Opinion: 5.6 || A comedy of switched identities that never quite works despite having all the right elements. The storyline is cleverly set up, but the comic acting is often weak, and much of the movie’s humor suffers from a labored obviousness. SYNOPSIS (Courtesy of IMDb): Sakurai, a failed actor, switches identities with a stranger at a bath house — only to find himself filling the shoes of an elite assassin. Strengths and Weaknesses: The trading-places storyline is very solid, and one of the two primary threads works well at times. But after an auspicious start, the movie never really takes off. Much of it can be traced to poor acting (see below), but Uchida’s comic touch is just not very strong. Moments that should be funny are either telegraphed or stepped on, and the movie is neither here nor there comedically — not loose enough to succeed as farce and not witty enough to be carried by its jokes. What we’re left with is a film that’s diverting and pleasant but never as funny as it should be. Now, for the sake of full disclosure: I saw this at the Portland International Film Festival (sold out showing) and was surrounded by people who chuckled their way through the movie. Many clapped at the end. Me, I mostly checked my watch. Which reminds me of a famous story: A world-renowned actor lies on his deathbed. His friend says, “Is it hard?” The actor answers, “Dying is easy. Comedy is hard.” It’s also highly subjective, and I may be hard to please. Characters/Performances: Masato Sakai is excellent as the amnesiac hitman Kondo trying to adapt to Sakurai’s loser identity, and it’s entertaining to watch him become a better Sakurai than Sakurai ever was. Unfortunately, Teruyuki Kagawa is not nearly as good as his other half, the hapless actor trying to fake it as a hitman. It’s a hammy performance that substitutes broadness for genuine comic timing or pathos. He’s not awful, just well short of amusing, and it’s tempting to imagine what the movie could have been with a more gifted actor in the role (for instance Aamir Khan, who brilliantly enlivens 3 Idiots). Best Moment: Ironically, the movie’s best scene is one that centers on Saurai’s repeated inability to stage a convincing death scene — despite his being a self-identified actor. His tone-deaf exaggerations are funny, but Saki’s frustration with his incompetence is what sells the scene, and it’s one of the few instances where Uchida gets everything right. Where are the English or any other language Subtitles for this Movie!?! ?